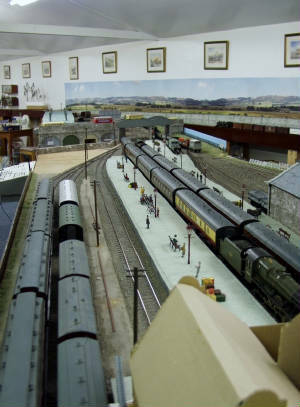 A small selection of photos of our layouts. The morning Push-Pull with L.M.S. 3F in charge, arrives at WYKE from the junction. The Push-Pull coach is a much modified early Graham Farish kit. A class 31 arrives at Dagnall with the morning pick up freight whilst a Gloucester R.C. & W. Co Motor Parcels Van waits in the bay platform for the signal to clear. 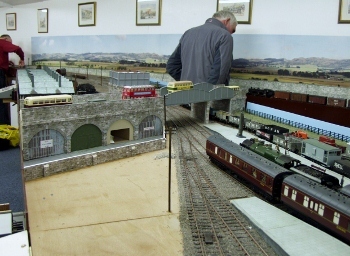 A general overview of WYKE station with an L.M.S. 1F half Cab loco arriving with the afternoon down pick up freight. 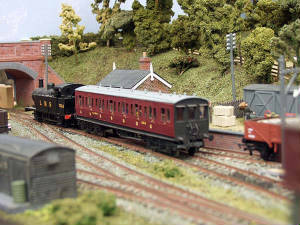 The Loco is a detailed Hornby 3F fitted with a Crownline conversion kit. An Ivatt ,2MT' waits in the bay platform at Dagnall with a through coach for the signal to proceed as a Derby Single Unit arrives from the junction. 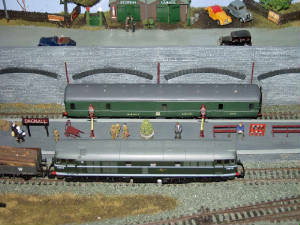 A rear view of, 'Stanton Road' loco shed with a Webb Coal Tank waiting its next turn of duty. 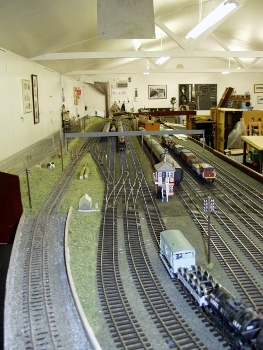 The scratch built signal box is very prominent. 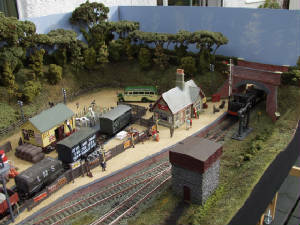 An overall view of the small goods yard at Stanton Road. The rail level ground surface area has yet to be installed over the rough sub surface. 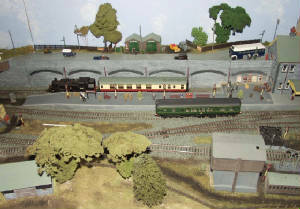 A view of the junction from the main line looking towards 'Stanton Road' branch terminus, showing the turntable and loco shed area. Note also the high level branch incline on the left of the photo. 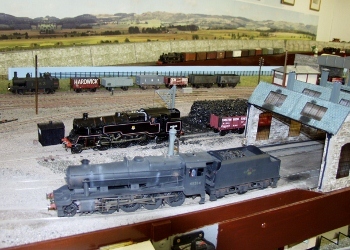 A general view of Stanton Road, Loco Shed with a grimy 8F awaiting its next turn of duty with a BR Standard Class 4 at the coaing stage. A Johnson 1F shunts wagons in the goods yard whilst another BR Standard tank passes on the goods relief line.. The road overbridge with accommodation arches beneath, home to 'Honest Ades Automobiles' and An Agricultural Supplies Merchant. A B.R. Patriot prepares to leave with a rake of B.R. Mk1 Coaches, whilst the Johnson 1F shunts the goods yard, Bill. In the background Bill attends to a problem on the freight Loop whilst Ray turns a loco ready for its next duty. An overall view of Stanton Road Station and carriage sidings, looking towards the junction with the main line. 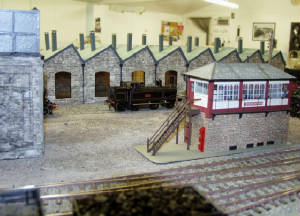 Just visible beyond the road bridge is the roof of the North Light Loco Shed and Signal Box. 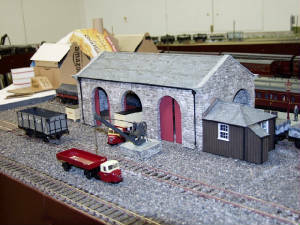 Note also the mock up of the station building, which is currently under construction. Another view of 'Stanton Road', branch terminus looking towards the station building with the carriage sidings visible on the right. 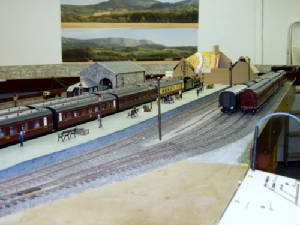 Note also the cardboard mock up of the station building, which is currently under construction. 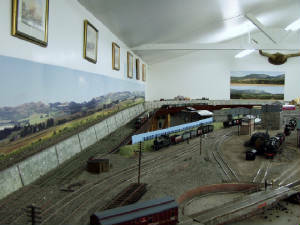 A general view over the scenic 'Fiddle Yard' with the high level branch descending on the left, the two through running lines and the goods relief line. The tail end of a freight is just disappearing from view. The five main storage roads are immediately to the right. 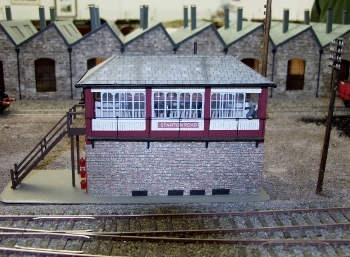 The very impressive Stanton Road Signal Box was scratch built by a member and sits on the apex of the juncion with the main line.